It looks as though The Sky So Heavy will be released at the end of July. I have relinquished it for good and it’s strange to think that I won’t be working on it anymore, it has felt like a member of my family for the past four years. I won’t see it again until it is an actual book in my hands, by which time it will be far too late to make any changes. In the meantime I am in a strange land where I must decide which story to turn to next. I have a half-finished manuscript that I have been tinkering with off and on for the past seven (eek!) years. I feel it has so many faults and weak parts and needs so much work that I don’t know if it’s worth spending my little scraps of writing time on. But I’m not sure I can give up on it. In the meantime I will try and tap into my main source of inspiration, music. 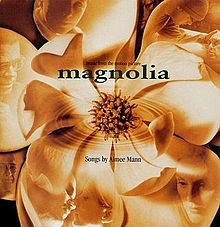 I was listening to Aimee Mann’s Bachelor No.2 this morning and was reminded of how Paul Thomas Anderson used it as his inspiration for his film, Magnolia. It will probably sound terribly naive, but I’m not aware of many other writers who have used singular albums or songs as the reference point for a story. (Do let me know in the comments if you know of any.) For me The Sky So Heavy grew, to a large extent, out of Radiohead’s The Gloaming. The mental image of a gloaming – a sort of murky twilight – combined with the words ‘Your alarm bells, they should be ringing’ was incredibly powerful to me. Now as the prospect of the dreaded ‘second book’ looms, I find myself feeling around for something new with enough potency to get the ball rolling. A few weeks ago I heard The Smashing Pumpkins’ iconic track 1979 on the radio for the first time in ages. There is something effervescent about that tingling guitar riff (Is that what it’s called? If I’m going to write about this stuff I should find out.) and those opening lines ‘Shakedown, 1979/ Cool kids never have the time’. I am toying with a story set in the mid nineties and have a sketched out a character who listens to Pumpkins obsessively on her Discman. So we will see where that goes. I have found in the past, and I’m sure I’ve blogged about it before, that sometimes the key to understanding a character, for me, is getting a grip on what kind of music they would listen to, and then listen to it over and over again while I write. It’s not neccesarily music that I would chose to listen to, either. If that manuscript that I mentioned earlier on ever sees publication, you will find in it a character called Kate who I didn’t know well enough until I figured out that she would have listened to a lot of Lana Del Ray. I’ve always thought SP’s ‘Disarm’ would be a good soundtrack song for a moment of unravelling in a character in a book or movie etc.